> Jack Fellows > Tiger! Image Size: 33" x 16"
Paper Size: 36" x 20.25"
Canvas Size: 33" x 16"
CANVAS TRANSFER - is a laminated process of transferring a printed image onto canvas using heat and pressure. A reproduction on paper is used to laminate onto the canvas surface using a sealer and is pressed into the canvas. The resulting image looks like it was painted on the canvas and is hard to tell from an original, unless labeled. It is a time consuming and an expensive process, but is still just a reproduction of the original. 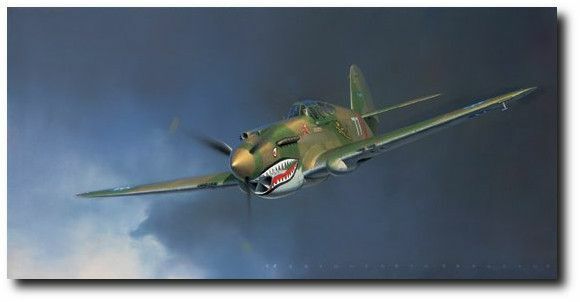 Tiger is a beautiful print by Jack Fellows showing a P-40 Warhawk in flight.